I’m always a skeptic when it comes to “easy” ways to lose weight, to “drop the pounds” or to “get skinny fast.” It’s not real life. Real life means putting work and effort into everything you do, weight loss is no different. I’m also a realist. I know that craving sweets is a real thing, it’s not an excuse. Sometimes, even after a big meal, you need just “one more bite” of something sweet…even if you really don’t. So, something to help in that department, to satisfy cravings and to give your body a chance to catch up in an all natural way? Bring it on. When I heard about MealEnders and the opportunity to review them, I was excited! It seemed like a good complement to a program that included healthy eating and exercise – not as a scheme or replacement for hard work. Even more surprising was the taste. 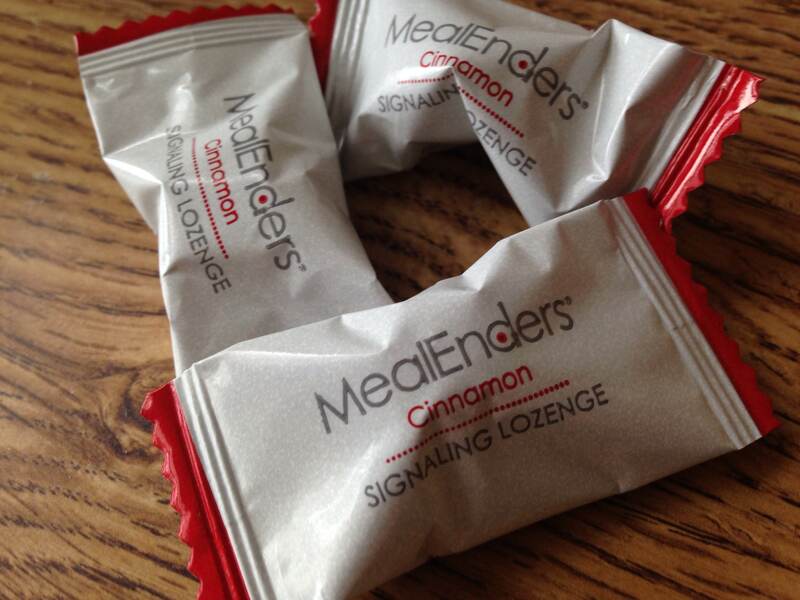 MealEnders come in four different flavors: cinnamon (my favorite), chocolate mint (a close second! ), Mocha and Citrus. They’re natural, with ingredients that anyone reading the label can understand, plus, each MealEnders signaling lozenge contains only two grams of sugar, 15 calories, and is low-fat, stimulant-free, gluten-free, kosher, and contains no high fructose corn syrup or MSG. MealEnders are food-based and, therefore, regulated by the FDA as a food product. This was exciting to me! 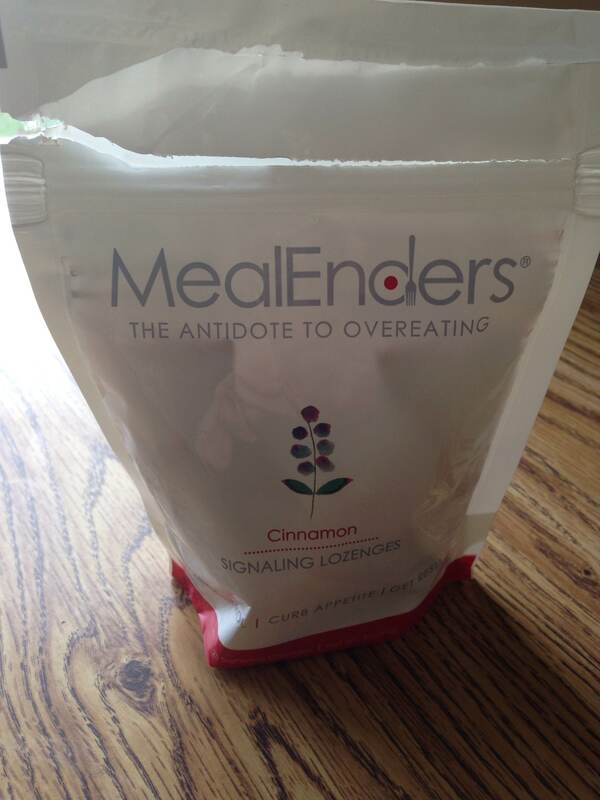 MealEnders consist of two components: a sweet, outer reward layer and a cooling/tingling inner core. The outer layer provides a measured dose of “dessert,” usually associated with the end of a meal. The inner core engages the trigeminal nerve (the nerve that senses “taste” sensations in the mouth) with long-lasting cooling/tingling sensations to cue the end of eating and clear the palate. By keeping your mouth and mind occupied for up to 20 minutes (the Overeating Zone—when you are full, but often continue to eat because your brain has not yet received the “fullness” signal), MealEnders naturally transition you away from the desire to overindulge, giving your body’s natural satiety process time to catch up and let you know your full. PSYCHOLOGICAL • Heighten mindfulness of natural digestive rhythms • Create habitual cueing of meal completion • Train the mind to recognize healthy portion sizes • Empower a sense of control. I allowed a few friends and family members to give them a try. While all reactions were mixed as far as what were the best flavors, everyone was a fan and could agree that the urge to add dessert after finishing a lozenge was almost gone. Note, it’s not a magic potion. Give yourself enough time and you could still crave something sweet, there’s no substitute for a little will-power!! Wanna give MealEnders a try? Awesome! MealEnders are available on the website: www.mealenders.com. Give them a try if you’re looking for a little something to boost your current efforts and let me know what you think!